The ISSA/GraceKennedy Boys’ and Girls’ Championships was so nice, diGJamaica had to do Image Of The Week twice! 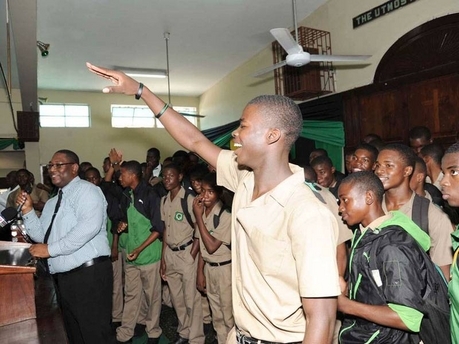 61 Red Hills Road was turned into Champs’ Central as Calabar High School was transformed as it celebrated its 23rd Mortimer Geddes trophy as winner of the ISSA/GraceKennedy Boys’ Championships. In the foreground is Class Two champion hurdler Michael O’Hara, while Principal Albert Corcho celebrates along side the winning team. The principal also said that all lost classes will be made up on Saturdays and via workshops and that Calabar was dedicated to the principle of the all rounded student athlete. The school’s motto is “The Utmost For The Highest”. DigJamaica wholeheartedly commends the Principal for this action and wishes all participants of Champs’ well as they get back in the groove of school and exams.